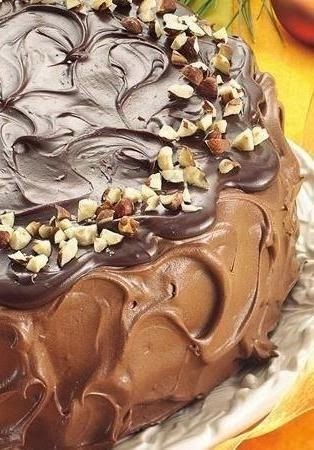 Enjoy this delicious chocolate dessert - creamy cake topped with hazelnuts. Heat oven to 350°F. Grease bottoms only of two 9-inch round pans. Prepare cake mix as directed on box using butter, water and eggs and adding coffee granules; pour batter into pans. Bake as directed on box. Cool 10 minutes; remove from pans and place on wire racks. In 3-quart saucepan, cook chocolate chips and coffee creamer over medium-low heat about 8 minutes, stirring constantly, until melted. Remove from heat; beat in cream cheese with wire whisk until smooth. Cover; refrigerate about 30 minutes. In small microwavable bowl, reserve 1/2 cup of the chocolate mixture; set aside for topping. Beat remaining mixture on medium-high speed 8 minutes or until it forms a light and fluffy frosting. Place 1 cake layer on serving plate, rounded side down. Spread 1-inch-thick layer of frosting over cake. Top with second cake layer, rounded side up. Spread frosting on side and top of cake. Microwave reserved 1/2 cup chocolate mixture on High 30 seconds or until soft; spread over top of cake. Sprinkle hazelnuts around top edge. Cover loosely; refrigerate at least 1 hour before serving. Store in refrigerator.